You asked for it. 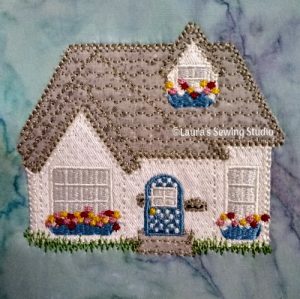 A 4-inch size Cottage Love design. I had to do some changes to make this design sew well in this size – i.e. the flowers, chain stitches, and polka dots did not sew well when shrunk to this size. I had to go in and swap out the flowers for some simpler ones, make a new chain stitch, and polka dots. But it sews well now. I know you will be as happy with this one as the larger cottages. Would you like an 8-Inch Cottage Love design? If so, then climb on board the democratic and caste your vote below. As I’m posting this, I’m in the process of finishing up a 3-D Little House made with felted wool that I plan to use as a paper weight or perhaps a pincushion. It looks so cute on my desk. I just love looking at it. It’s almost done so prepare yourselves. It will be a separate item because it has a front, back, 2 different sides, and a bottom. Also some oh my goodness instructions I have to make. And a 2-story cottage is coming! So keep your eyes peeled. I love the cottage, it is so adorable! I think I would use mine as a pin cushion. And probably make a second one for display only, that’s how adorable it is!